What is a history of sent invitations? What did you text?When? And the most important question is how many men replied to them? To find the answer on these questions you can with a help of a tool just clicking on the button “History” in the right side from a text block with your invitation. Then you will see the section “History of sent invitations”. You can see a list of sent invitations by you. What you texted and how many men replied to them and when you sent this message for the last time. If you want to resentthis invitation, just clicking on it. After it the main extension window will be open and there an invitation you clicked on in the text block of message will be inserted. To know what, when they texted and how many times they replied – do only one click on – the button “History”. To resend any invitation – double-click – a button “History” – click on an invitation from the table. Quickly? 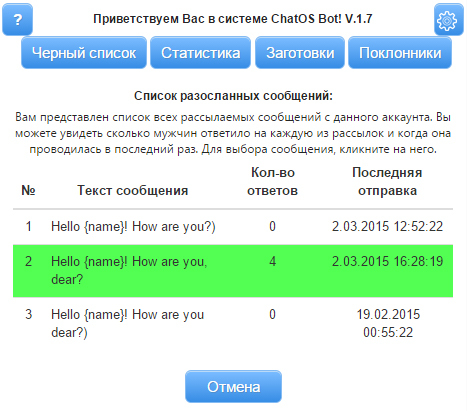 We hope it will make your chatting more pleasant. Have a nice chat! Sincerely, the ChatOS team.